A good turnout at the speeches for the upcoming King’s Student Union election could mean a better voter turnout. In the past, KSU had a difficult time trying to reach their high quorum of 25 per cent. At a school of about 1,200 students, this means 300 students have to vote in this election. About 60 people attended the election speeches Monday in the Wardroom. Current KSU President Michaela Sam says this is a very good sign. 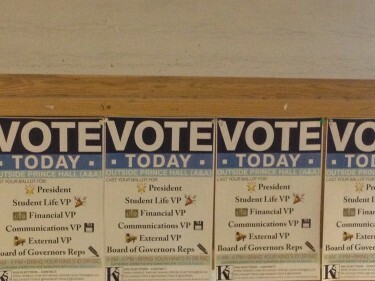 The KSU has been trying to make elections more accessible to students. The Watch live tweeted this year’s elections and the KSU put them online. Election booths also now close at 6 p.m. instead of 5 in previous years. “Everyone who wants to vote has the opportunity to do so,” said Sam. Among those topics brought up in Monday night’s speeches were strongly supporting King’s athletics. Better mental health services at King’s and Dalhousie and support for minorities on campus were also mentioned. Sam says the student union is also cognizant of the financial issues that King’s faces. Voting will take place outside of Prince Hall in the A&A building from 9 a.m. to 6 p.m. Wednesday and Thursday.